I have been mentioning that few times before – my Skaven Swarm Army is almost done. All is left to paint: around 10 Skaven Slaves and 10 Clanrats. I need about few weeks to finish them and, for the first time in my life I’ll be able to play with entirely painted army (It will be only 1000-1200 points, but still). To be honest, not only I never had any of my armies painted – in last 12 months I’ve painted more miniatures, than the rest of my life! I was kind of lazy back in the days – definitely I was preferring playing, than painting (now it’s opposite – I barely play and try to paint as much as possible). I was kind of addicted to buying new armies – both fantasy and 40k. Every time something new was released – I wanted to have it! Ok. Right now it’s similar – I want to have tons of miniatures. There are so many cool models, just begging to buy them. But right now, I’m more resistant – I try to buy just what I want and stick to those armies I have (do not even try to start collecting new ones:). I owe right now: about 2500 points of Skaven (1000 points painted), 2000 of Lizardmen (none painted:) and just handful of Blood Angels for 40k (one librarian painted). I don’t plan to buy new armies in near future, unless I paint most of the minis I have at the moment. Strong resolution, I know – but so far I manage to stick to it. I buy (and paint) mostly Skavens at the moment. I want to expand my painted 1000 points up to at least 2k. They should look super cool and to be my first show of army. Slaves, Clanrats and Stormvermin – they are the core of my army. Almost all done. Good choice? – I don’t know. Time will tell. When I think, in which direction should I go – which regiment should be next (beside of course more slaves and Clanrats) – Rat Ogres come first to my mind. New Rat Ogres are super awesome. Right now I owe 3 of Island of Blood plastic rat ogres, and 3 old metal 5th edition models. What can I say? New plastic ones are thousand times cooler – I really love how they look right now. Especially this one I have finished today. Check it out. 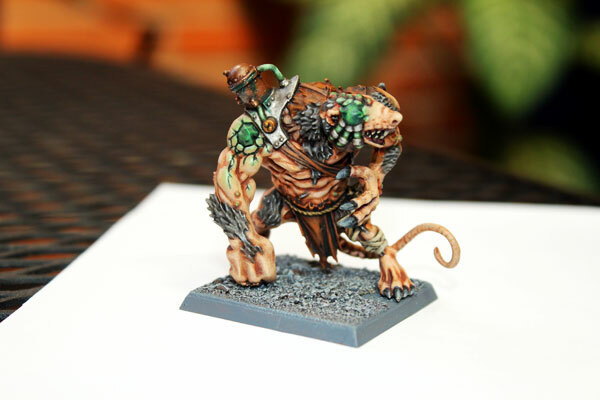 Skaven Rat Ogre – first of many! The warpstone stuck in its arm, warpgem instead its eye and copper fuel container on the back. WOW! 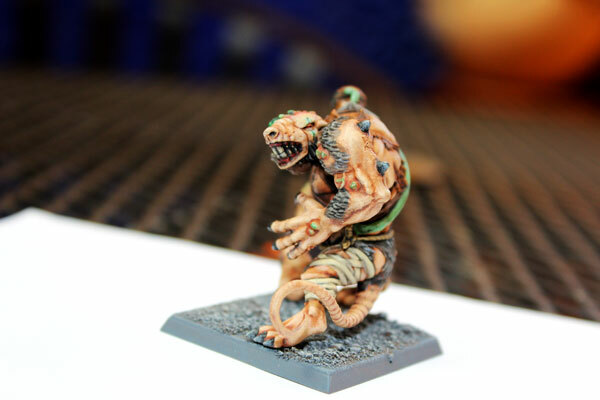 Clan Moulder made their masterpiece this time – seriously, comparing to old Rat Ogres, this one is a their top achievement. 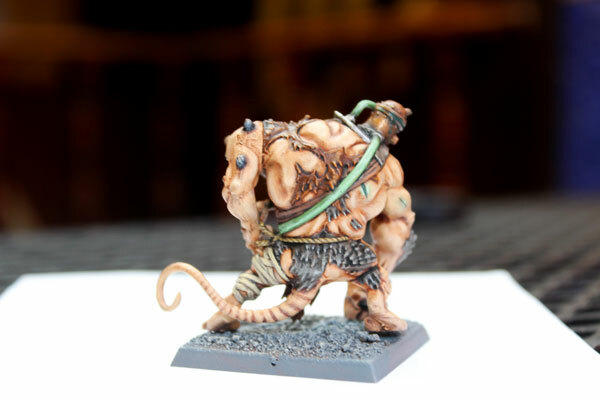 Finally it looks like – some poor Skaven was taken to the Clan Moulder’s lab and pumped with warpstone until it get its ogrish size. I wanted to paint this rat ogre, having in mind these laboratory experiments. It’s full of warpstone powder and liquid in its body. So, I painted every scar, not bloody red like I should, but green – dark inside the wound and glowish around it. I’ve never done any glow on the skin on any model before – I tried to made transition from Kilev Flesh ( the normal body colour of Rat Ogre) to light green edges of the wound. I wish I have with me right now green shade to put it into the scars, but Nuln Oil instead on Caliban Green was also ok.
What do you think? I would really have any opinion on this – It’s my first time I’ve painted warp infected body. And another issue. If I ever will put Rat Ogres Regiment on the battletop, I need some model to represent Master Bred Rat Ogre. I’m thinking about using one of the old Bone Ripper models. It’s little bigger, it has three arms and looks exactly like enhanced Rat Ogre should looks like. Is there any other alternative? Any ideas folks? Of, course I could made some conversions – but I believe I mentioned this before – I prefer to paint than make conversions. I’m not good with sculpting. Are Rat Ogres worth it? The main problem with Rat Ogres, in my opinion, is that they look big and scary – and they catch attention. Your enemy might not know, they are frenzied, have stomp and cause fear, but he will know for sure – these big bastards mean trouble – and think: I should put them down right away. Not giving them any opportunity to fight. And poor Rat Ogres usually become first target of every bow, cannon or spell on the battlefield. Toughness 4 and no armour saves hmm… they will not survive long – prepare to lost them pretty soon. Personally, I love these models, but the affection is not big enough to use Rat Ogres in competitive battles. But in casual games – it’s other story. Perfect choice. I believe though, there are many tactics, and many ways to the victory. Every Skaven General has it’s own. Unfortunately, I can’t offer any advice to you about them being worth it or not, I don’t do fantasy. But… the ‘rule of cool’ says that you definitely include them! The rule of cool is always my indicator:) Thanks! 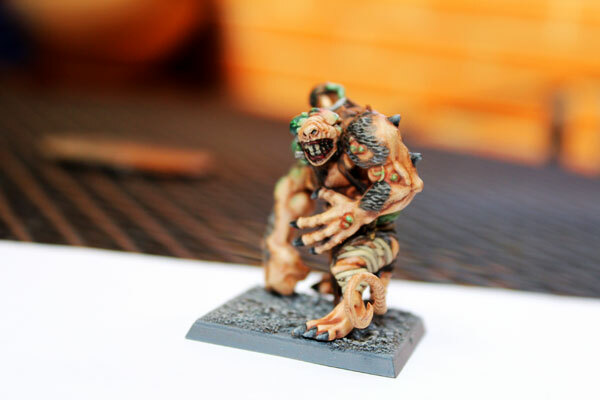 Great looking Rat Ogre you’ve painted there. Your paint certainly lives up to the great sculpt and brings out the details really nicely. Kudos!